- Save 15% when you open a new credit card account. - Get $15 off one purchase on your birthday. - Receive our exclusive newsletter, with special offers and coupons. 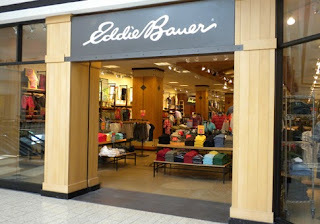 - Eddie Bauer Store Locations. Now through july-4th, everything is up to 60% off at Eddie Bauer stores. Great in store and online offer worth mentioning from Eddie Bauer, coupon not required. Get a 30% discount on your entire purchase in store, coupon not required. Print and present coupon for a 10% discount on your entire in-store purchase. valid at Eddie Bauer Retail stores and Eddie Bauer Outlet stores. Print out the whole email. 10% Off offer valid on all merchandise at Eddie Bauer Retail & Outlet stores. Eddie Bauer is your source for casual, comfortable apparel, shoes and gear! Their clothing store online offers quality clothing for men and women that complements today's modern lifestyle. Whether it's traditional outerwear, legendary down or casual denim, Eddie Bauer provides a full range of products like shoes, summer clothes, jackets, sandals, jeans, sweaters and more.